The story: J.R. Ewing, the devious oil man memorably portrayed by Larry Hagman on “Dallas” in the 1980s and again on the reboot that debuted in 2012, enjoyed his bourbon. And now he has his very own brand. In conjunction with the start of the TNT version’s third season earlier this year, Warner Bros. teamed with an independent blender to produce J.R. Ewing Private Reserve. The blend of 4-year-old bourbon from an undisclosed Kentucky producer is bottled by “Southfork Distilling Co.,” and the bottle features a screenprinted image of the iconic gate to the Ewings’ Southfork Ranch. A regional rep for the bourbon kindly provided me with a sample for review. Is it more than a publicity stunt? Read on. The aroma: Once in the glass, this bourbon is a very light straw color, and the nose is also light – sweet, with a lot of corn and vanilla and a note of molasses. Think candy corn. The taste: Again, very light and sweet on the front, with a lot of corn and a little oak and not much else. A mild tingle on the mid-palate gives way to a short finish. Simple and basic. 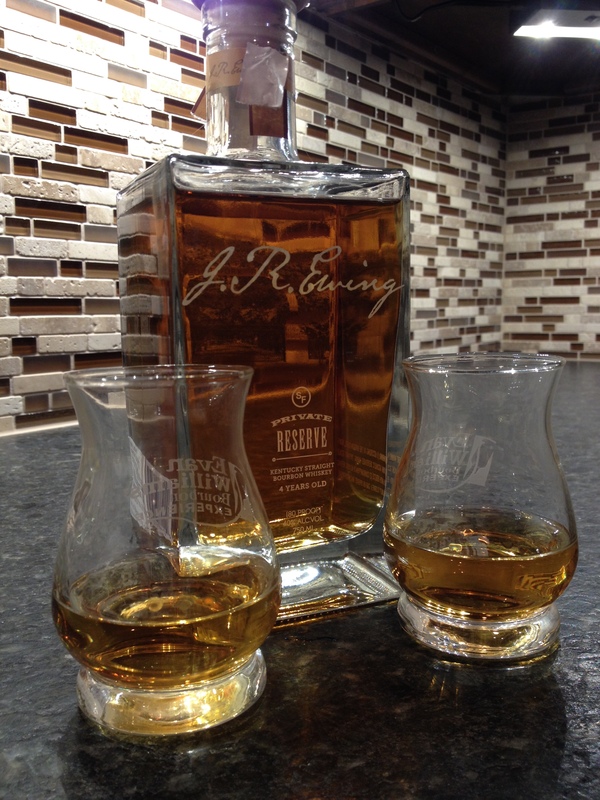 can i buy j.r.ewing bourbon any where in canada? I’m surprised of the less than glowing reviews for JR Ewing Bourbon. My relatives and I actually loved it. We have become Bourbon lovers this past year (under $40) and thought JR Ewing Bourbon was “almost” as good as our favorite Buffalo Trace. Our favorites in descending order have been Buffalo Trace, JR Ewing, Old Forrester, Knob Creek, and Old Granddad 100 proof. For Rye Whiskeys we like Old Overholt and Jim Beam Rye. Hi, Conan — I didn’t think it was a BAD bourbon, just not as complex/spicy as I’d like. But the great thing about bourbon is that there are no wrong answers! Spot on, I like your tastes and choices. You don’t have to spend a lot for some great whiskies. I have a lot of rare high dollar bottles and some not so expensive bottles that are very much enjoyable. Just tried the J,R Ewing private reserve. Not the kick I’d hoped for, but surprisingly refreshing if you will. I’m more of a on the rocks kind of guy, but with this adding ice watered this light bourbon down to almost nothing. Very sweet on the front but not a Jack Daniels kind of sweet almost a Honey. The oak at the end is what saved it for me. That’s a tough one. I checked Binnys in Chicago, which has a huge selection, but they don’t have it. You might check with your favorite local store to see if they would order it for you. Good luck! try Total Wine and More. I’m in Albuquerque, and I know they carry it. Personally, I really like it. Very smooth going down.